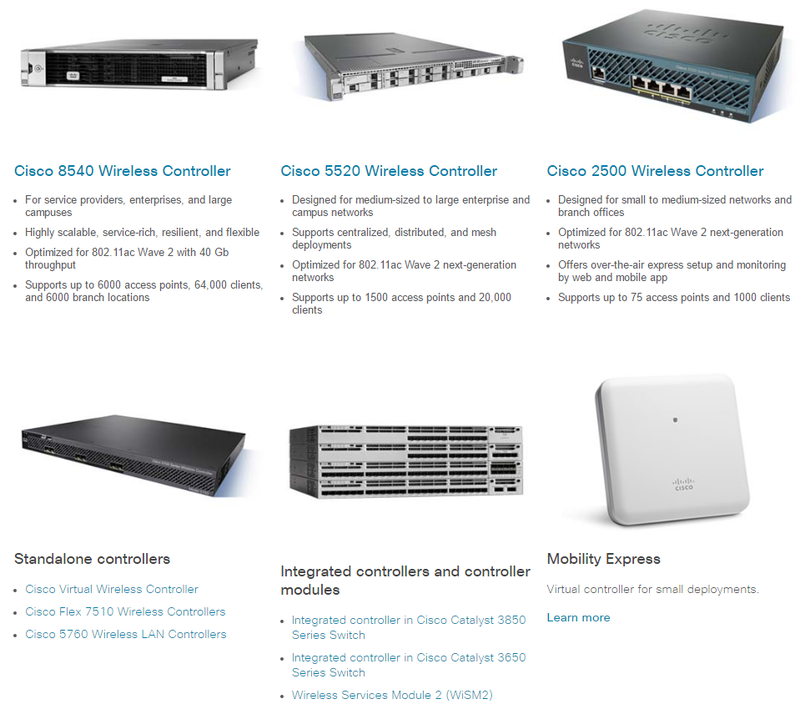 What can the Cisco Wireless Controllers (WLC) exactly do for you? 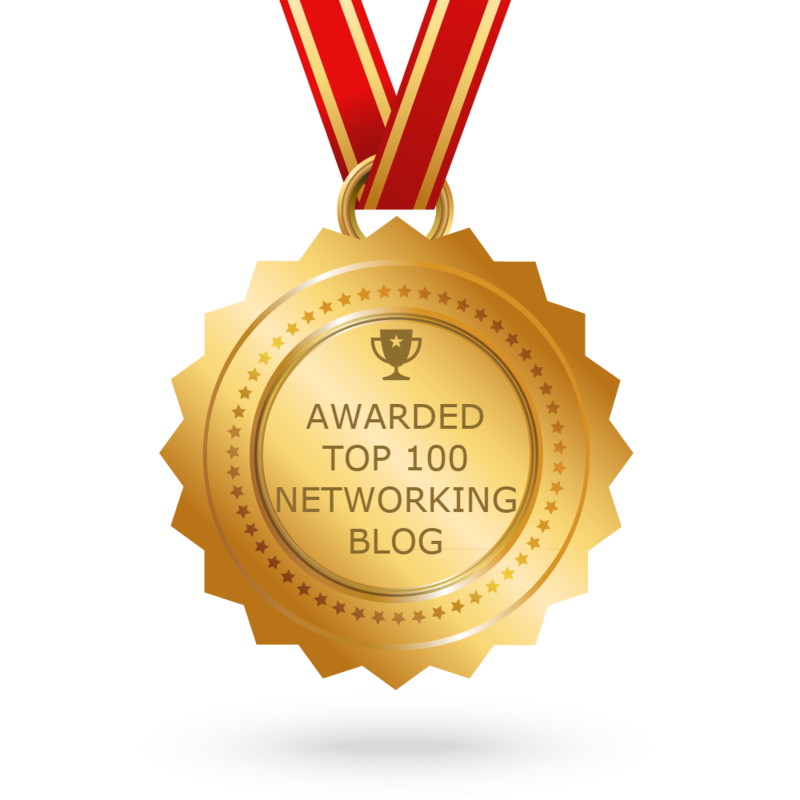 Wireless networks have become a necessity today as more and more organizations have higher requirements for the network designs and solutions. WLC is a device that assumes a central role in the CUWN (Cisco Unified Wireless Network). Traditional roles of access points, such as association or authentication of wireless clients, are done by the WLC. Access points, called Lightweight Access Points (LAPs) in the unified environment, register themselves with a WLC and tunnel all the management and data packets to the WLCs, which then switch the packets between wireless clients and the wired portion of the network. All the configurations are done on the WLC. LAPs download the entire configuration from WLCs and act as a wireless interface to the clients. Single-point of policy across wired and wireless networks with Cisco Identity Services Engine (ISE). Cisco ISE enables enterprises to adapt to the exponential growth in mobile smartphones, tablets, and laptops. Optimize the performance of your large wireless network with centralized visibility and control. The Cisco 8500 Series Controller and the Cisco 5760 Wireless Controller are designed to cost-effectively manage, secure, and optimize the performance of sizeable wireless networks. 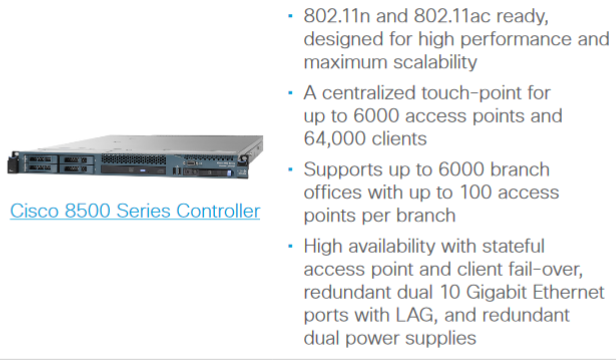 Ideal for service provider and large campus deployments, the 8500 Series Controller and the Cisco 5760 Wireless Controller enables high-scalability on an as-needed basis. IOS based wireless controller with rich feature set like Flexible Netflow, Hierarchical QoS with four hardware wireless queues, downloadable ACLs, etc. The Cisco Catalyst 6500 Series WiSM2 is a highly scalable, integrated blade switch that extends the same policies and security from the wired network core to the wireless edge. 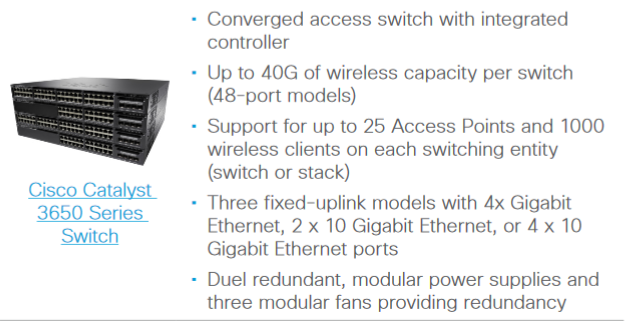 It lowers hardware costs and offers flexible configuration options that can reduce the total cost of operations and ownership for wireless networks. 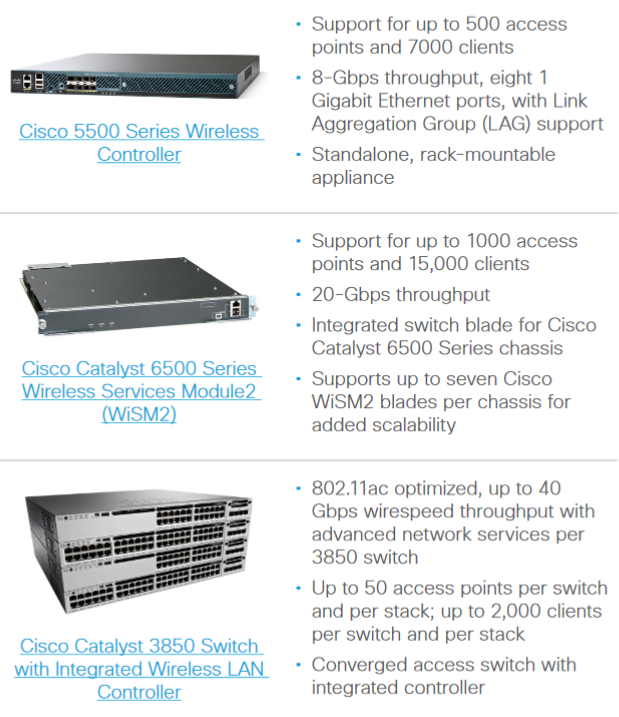 You can cost-effectively manage and secure your wireless networks with the high-performance Cisco 5500 Series Wireless Controller, Cisco Wireless Service Module 2 (WiSM2) Controller on Cisco Catalyst 6500 Series Switches and the Cisco Catalyst 3850 Switch with integrated Wireless LAN Controller. As the industry’s most deployed controller, the Cisco 5500 Series Wireless Controller provides the highest performance, security, and scalability to support business communications today and in the future. Seamless, high-quality mobile experience: Efficient roaming capabilities help ensure consistent experience on any smart mobile device with voice and video applications. Reliability: Cisco 5500 Series Wireless Controllers provide industry-leading IPv6 roaming with secure access. 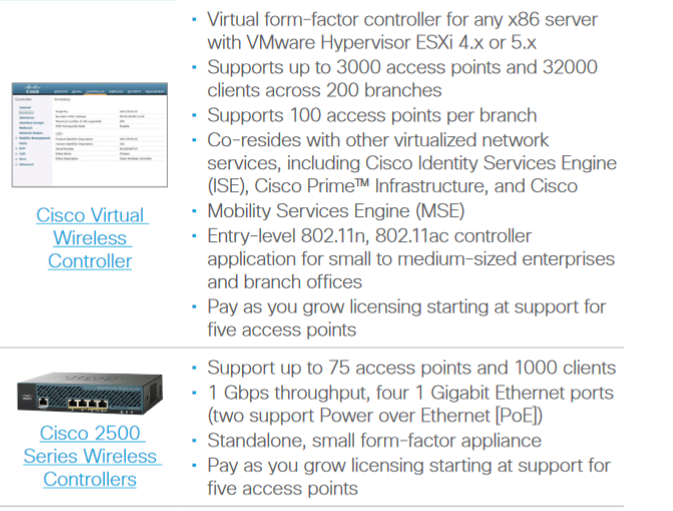 Flexibility to pay as you grow: The Cisco 5500 Series offers software license flexibility to add additional access points as business requirements change. 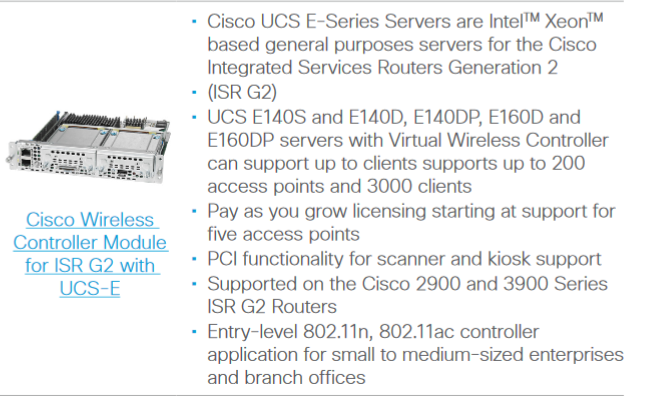 Versatility: Supports advanced services for any network use case, campus or branch, including Cisco OfficeExtend solutions for secure mobile teleworking and Cisco Enterprise Wireless Mesh solutions, which allow access points to dynamically establish wireless connections in hard-to-connect locations. Deploy the Cisco Wireless Service Module 2 (WiSM2) Controller on the Catalyst 6500 Series Switches to help enable systemwide wireless functions in medium-sized to large enterprise environments. IOS based wireless controller integrated within 3850 switch offering a rich feature set such as Flexible Netflow, Hierarchical QoS with four hardware wireless queues, Downloadable ACLs, etc. Consolidate your wireless branch network with the Cisco Flex 7500 Series Wireless Controllers to help network managers cost-effectively manage branch networks. Its robust scalability significantly lowers operating expenses by providing the visibility and control needed to manage thousands of wireless branches from a single location. Cisco 2500 Series Wireless Controllers, Cisco Virtual Wireless Controller, and the Cisco Wireless Controller Module for Cisco Integrated Services Router Generation 2 (ISR G2) and the Cisco Catalyst 3650 Series Switch provide small branch or singlesite enterprise WLAN deployments with entry-level wireless for data. They are ideal for improved mobility with laptops, providing guest access for vendors or customers or offering limited hotspot coverage. Now you can enhance the productivity of your growing mobile workforce, and scale and add services over time. These controllers offer deployment flexibility onsite, with virtual machines, or through integration with a router.